Here’s our newest listing. This large home sits on an oak shaded .79 acre parcel in southwest Redding. It has a nice pool and a spa. The main house is a 2335 sqft 3/2, but has a large addition not counted in the footage. That’s the room with the billiard table, and the other one through the doorway. It also boasts a detached 1/1 in law unit. There is also a pool house with a full bathroom for a total of 4 full baths. There is a 2 car garage, a shop, and some more outbuildings on the spacious, level lot. You can also purchase the adjacent .81 parcel for a negotiable price. One bedroom has a wheelchair accessible shower. The seller is wanting to downsize, so may look favorably on trading equity into a smaller, neat local home. Never hurts to ask. Below is our tour video. Be sure to watch it in 720p HD. 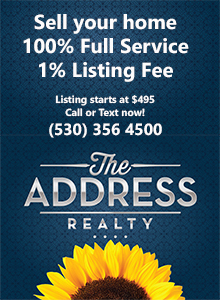 Call us if you want to see more of the home, or call your Shasta County Realtor. (530) 244 7603. This entry was posted in Real Estate, The Address Realty and tagged Real Estate, Redding, The Address Realty on October 24, 2011 by Skip@RHB.